There's a small town in Kentucky called Tompkinsville, nestled into the foothills of the Appalachian Mountains just north of the Tennessee border. A decline in the local garment industry hit the area hard over the past several decades, and a striking 30 percent of the approximately 2,000 locals live at or below the poverty line. Surrounded by the quintessential small-town lifestyle, where the postcard-perfect landscape meets friendly Southern charm, future businessman Greg Hall first dreamed about the Kentucky Derby. 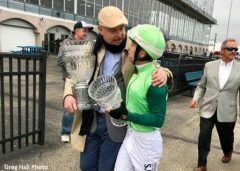 Admittedly, Hall said he was “heartbroken” on the Friday before the Kentucky Derby, when no scratches had been announced for the 2018 Run for the Roses. A colt he co-owns, Blended Citizen, was the only also-eligible entered in the race and would have given Hall his first Derby contender. However, a lack of defections from the 20-horse field meant that the 3-year-old son of Proud Citizen was left on the sidelines. Bloodstock agent and racing manager Brooke Hubbard, who'd originally selected Blended Citizen out of the OBS March 2-year-old in training sale for a price tag of $85,000, remained undeterred. She suggested the Grade 3 Peter Pan the following weekend at Belmont Park as an alternative and as a potential prep race for the Belmont Stakes. The week leading up to the race, several other horses owned by Hall and Young came home as also-rans in their starts and Hall was feeling frustrated. Then on Saturday, Blended Citizen came rallying from well off the pace and ended up on top in the 1 1/8-mile Peter Pan, finishing strongly enough to suggest the 1 ½-mile distance of the Belmont would not be an issue. As a young boy, Hall had taken a few trips to Keeneland to watch the races with his grandfather. He'd grown up with horses —his grandfather raised Tennessee Walking Horses — but Hall had never seen anything quite like the majesty of the Thoroughbred. Those images stuck with him through his years at the University of Kentucky, and Hall joined the throngs of his fellow Wildcats enjoying everything Keeneland had to offer. 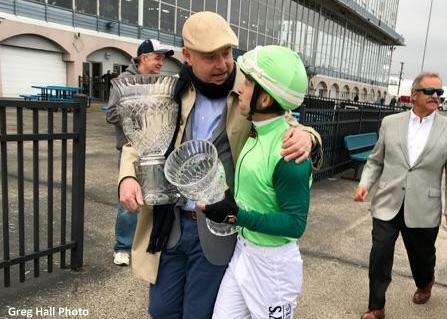 “I'd learned how to read the form pretty early on,” he said, acknowledging his trips to the jewel of the Bluegrass were more about the horses than the jovial atmosphere so revered by the majority of college-aged fans. From 1984 through 1990, Hall served in the U.S. Navy, which eventually landed him in Southern California. The entrepreneur then discovered his passion for growing a business, specifically in the packaging industry. Steve Young, meanwhile, operated the majority of the recycling plants across the state. Their companies were naturals to work together, and it was about 10 years ago when Young and Hall first grew to be friends. Hall sold his company in late 2012, and it wasn't long after that he agreed to join his friend on a horse racing adventure. After a few short ventures in the claiming and pinhooking realms, Hall quickly decided that he'd rather stay in the racing end of the game. His first major success with Young was a filly named Ms. Bad Behavior, a stakes winner and graded stakes-placed daughter of Blame. Hubbard had selected her for $75,000 at the Keeneland September yearling sale. 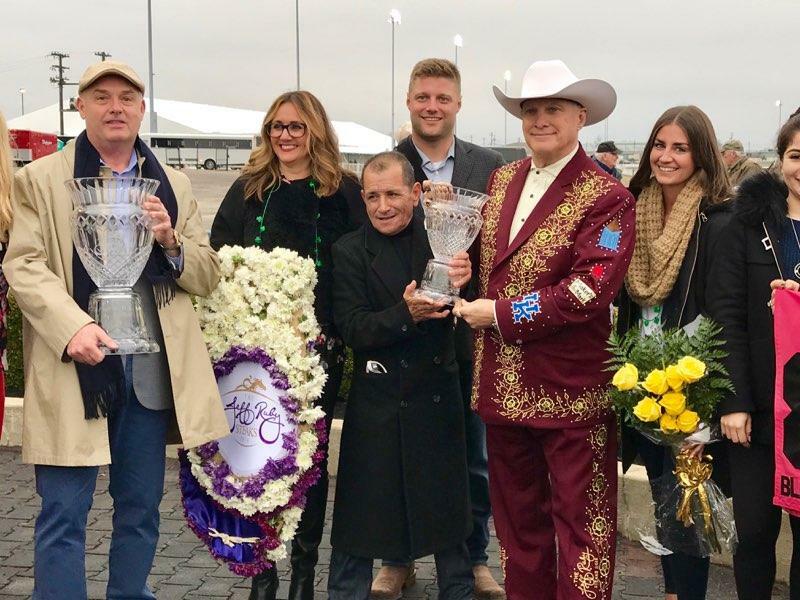 Blended Citizen gave the friends their first graded stakes win earlier in 2018, winning the G3 Jeff Ruby Steaks at Turfway Park; Hall was present for that victory. The colt finished a late-running fifth in the G2 Blue Grass at Keeneland, placing him just out of the reach of the Kentucky Derby field. Still, Hall firmly believes Blended Citizen has the stamina to be a serious contender in the Belmont. This entry was posted in Connections, NL List, People and tagged belmont stakes, blended citizen, Breeders' Cup presents Connections, Chelsea Hackbarth, Connections, Greg Hall, jeff ruby steaks, Kyle Frey, Steve Young, Triple Crown by Chelsea Hackbarth. Bookmark the permalink.